Thank you for the article, some great points. I've a question about neck resizing. You mentioned that you didn't accept the logic behind that procedure, as if you work the neck only - the rest of the case "body" will grow. But I thought that the whole idea behind neck sizing was that the body of the case "fire-formed" to dimensions of your specific chamber and now has nowhere to grow! What is wrong with this theory in your opinion? I'm a novice at reloading - so please take my question kindly. That theory is based on the idea that you continue to let the case grow until such time as it doesn't fit in the chamber any more. THEN you squeeze the whole thing back down to "normal" size. This BTW REALLY works the brass that you have been here to fore so concerned about. Reality is sooner or later the case from THAT gun will no longer fit in THAT gun. My opinion is that you let the brass grow until you are bumping the shoulder back 0.002" to smoothly fit into the chamber. From that point you are only working the brass a small amount at a time. Working of brass is not cumulative, a little bit very often does not do the damage of one monster squeeze every 5 reloads. I am into 40+ reloads on several batches of brass and have many more retired "bunker lots" in excess of 50 reloads with full house 308 loads (44 - 45gr of Varget under a 175/178) and others. No case head separations to date and only a fist full of neck cracks. Something works, and they all feed smooth every time. For the masses: Reloading 201 is on the way. I'm struggling with the physics/mechanics behind this reality - what makes the case grow beyond the chamber size when it's "bounded" by the bolt face on one side and by the chamber walls against the shoulder on the other? I understand your reasoning now. Thank you! I hope to be able to repeat this success some day! You will see this happen as the bolt lift gets progressively more and more difficult after each firing. As with water to ice, the brass is hot coming out of the gun and as it cools it expands just a bit more. If it's already a "tight" fit, it now "won't fit". It's never a pleasant sight to see a fella show up at a match with a box of carefully neck sized/turned and prepped ammo that he finds he can't get into the gun. Ah, I see - so the reason is that the brass <span style="text-decoration: underline">expands</span> a bit as it cools <span style="text-decoration: underline">outside</span> the gun <span style="text-decoration: underline">after</span> ejection. Thank you! Oh, one more question. Do you anneal? If so - what machinery do you use for that (or just a propane torch and a bucket of water)? OBTW guys Reloading 201 is up. It explains in more detail some things and has some new bits of kit that I have found useful. It is an adjunct to this post. I will not say that I am experienced, but I started reloading last year, and between several reloading manuals and Doc's posts (both 101 and 201), you should be pretty set. I would definitely use the drill press technique mentioned in 101, get a good set of calipers if the kit doesn't come with one, and I like to have both a digital and analog scale. The RCBS 750 is very handy, but sometimes gets finicky, so then it's good to have a 505 as backup. Read as much as possible, figure out what sounds good, then give it a try. You might find out you would tweak some of your individual components, but for the most part, if you're seeing certain pieces mentioned in the manuals and on numerous posts, it's probably for a reason... it works. Stay safe over there. Doc, this is awesome! Thanks for the info! Excellent job Doc. Still fairly new to reloading myself, you have touched on everything very clearly. Greatly appreciated! <div class="ubbcode-block"><div class="ubbcode-header">Originally Posted By: JLM</div><div class="ubbcode-body">Whoa! Is this a .308? Book maximum length to the neck of a case is 2.015. Now granted your chamber might be more generous but without a way to measure it, you should have trimmed once they got over 2.015, usually back .010 ie to 2.005. Do you have a current Lyman book consult? Its a very handy reference for all sorts of things. Trim lengths, procedures, you name it. Am I to gather that an off-the-shelf Dillon RL5550B press and dies won't produce 308s of sufficient quality for precision shooting? I'm a novice, so would appreciate knowing the downside to buying such a reloading rig. Thank for the help! I am just starting back reloading-I did years ago, a 30-06 (the dies were already set up in the outfit I bought.) I am now working on reloading for a .223 in both a bolt gun and semi-auto...I have a set of hornady dies, and it has two types of instructions--one for a crimp and without. What does this mean? The bullets I'm gonna use don't have a cannuleture (sp?) ...Any advice would be greatly appreciated! You can't use the crimp feature in the hornady die unless you have a cannelured bullet. Just set the die as per instructions for seating without a crimp. If you want to crimp with the hornady seater die for the AR (some do and some don't),then you'll have to get cannelured bullets and trim all your brass to the same length. If you don't get any better answers you might try asking your question by starting your own thread where it will be more likely to be seen. Right above where you posted in this thread there is a space for New Topic. That is where you would post a new thread. I really don't think you'll have any problem without crimping as neck tension generally is adequate to hold the bullet especially with a 69 which is going to be at mag length with a lot of bullet in the case. I've looked everywhere and can't find out how to deprime shells with live primers(ie: high primer) I was hoping I could save my brass and not have to throw it away. I have a box half full of loading screw ups and I need to deal with them. There are ALOT of theories about this. I will tell you what I do and you can decide. Good time to do maintenance on your press. Un-bolt it clean it and get ALL of the powder an' grunge off it. Put it back together and leave it dry or just a light lube. Lube your case as normal. SLOWLY, resize or deprime your case as you normally would, smooth is good, slow and smooth is better. As each unfired primer falls out track it down and remove it from the area. In your case I would measure as needed and not let them grow beyond 2.02" or even 2.015" before trimming them back. I hate trimming and will go as low as 2.0" just so I don't have to. It has shown no detriment to accuracy in my sticks. I'm not saying the 550B is not a good press but anytime you introduce "progressive" to "precision" something will give. If you are starting out IMHO it is much wiser (and safer) to have a single stage press so that you can see exactly what is going on at all times. Once you get comfortable you will be able to decide if a progressive will fit your needs. Thank you for a ton of great information. Wow this was/is an incredible write up. I just bought my first book today and began to spec equipment at the Indy 1500 gun show. So many options it was overwhelming. Really glad I came across this. Thanks Doc for passing on the great information. I agree with doc I clean my press and do it slow with no problem. No powder or flamables around. I havent had any go off yet. I find myself coming back again and again to the write up. If the powder delivery system of a could throw stick powder consistently I never would have mentioned a single stage press. THAT is the single drawback to a progressive. You can go as fast as you want but you can only throw powder so fast. It's not that I don't like progressives, I have a Dillon 650XL. I am just of the opinion that if I want that round to count way out there then I should be present for every stage of it's construction. You can't do that on a progressive. that is some nice food for thought, thank you for your experience and knowledge. ive made up my mind and going to go single for sure. Does it matter all that much to you RCBS Hornady single stage? I'm partial to the Redding Big Boss II, simply for ergonomic reasons and the fact that I never have to chase a spent primer again. It has a big wide footprint, an offset "O" and a hole drilled through the ram that you can attach a hose to and feed the spent primers right into a garbage can. Which ever you buy get the one with the bushing in the top so that you can utilize a quick change die system like Hornady's Lock n Load. Start your rifle load development with a good Ogive measurement for your rifle's chamber and back off .01 to .005 and keep all bullets loaded to this until you have found the best load. A good beam scale (the 505 is fine) is like a good single stage press, it will always be there and it will always work. Digital scales are all well and cool if you are measuring diamonds and such but to be sufficiently accurate for reloading they have a tendency to be a bit touchy IMHO. Case trimmers, look back at the original post, Giraud is top notch but in the 308 I do like the Possum Hollow, then again I trim short and let it grow cuz I hate trimming. Even on cases w/ 50 reloads I'm pretty sure I haven't trimmed them more than 5 times. Brass takes a long time to grow 0.020". Thanks for the info, this is going to help me out a lot. This is absolute "MUST KNOW" info and should never, IMHO, be removed from where it's at as a "Sticky". Thanks a million for the great insight. Looking at my hornady book starting new loads with new amax heads for 308. The book has two sections for the 308. One for standard 308 1:12 twist and another for "service rifle" 1:10 twist m1a. This is closest to my pof I guess. Now the question is can I load for standard 308 and shoot them? The service rifle is on the average of 3gr less. Thank you in advance to the more vet reloaders. Doc, this is an excellent instruction set. I am getting back into reloading after a 15 year vacation and the article is an excellent review.. Now off to the second thread. Doc, Could you please elaborate? Why don’t you think it is necessary? 101 basics, good topic and you have the basics covered. I've been loading for almost 40 years and I read all of your post, I'll be incorporating some changes to my routine. I do have some comments to add, concerning dies. This goes well beyond reloading basics. I also use low cost Lee, RCBS, Lyman and Forester dies. All dies are not the same, they are individual and sometimes they need some rework. I've had dies that overwork the necks and undersize the bodies for my guns chamber, brass combo. When I buy a dies set I first clean them thoroughly and polish the expander button like you suggested. I then check how it sizes a case. With the decapper removed I size a case. I check how much the neck was sized, ideally the inside dimension should not be much less than the expander, for a 30 cal I like to see no smaller than 300, 303-304 being ideal. Some dies resize a bunch, like 280-290 and necks will split after a couple of reloads. Next I smoke a new unfired case and size it, this gives me a visual of of the die dimensions. I do not want a die that makes the cases smaller than a factory round. If it passes these tests it is good to go, if it does not I'll either rework the die or buy another one. Not all brass is the same and neck thickness varies, sometimes a die works best for a specific case. Sometimes a die needs to be reworked for a specific rifle chamber. Again like I said, beyond basics but something you may want check. The last die dimension I check is headspace. I have a slightly different recipe for adjusting the die in the press, not that I am suggesting yours is wrong, it's not, just I do it differently. I screw the die in until it contacts the shell holder, then I carefully screw it in some more so that press exerts some clamp or compression force. I then size some fired cases and observe that there is no gap between the shell holder and die. This ensures that all the cases will be the same dimension. I now check if the case fits in my gun (trim first). I have had one instance where it wouldn't fit, everything else was good so I had my gunsmith modify a shell holder for me, he took several thou off the face and it was good to go. Most dies will size enough for the shell to fit. I then put a piece of masking tape on the back of the case and check the fit again. It usually is hard to close and squeezes the tape. Ideally you want about 2 thou clearance. Redding makes a set of shell holders in 2 thou steps (-0.002 > -0.010) for 308 & 30-06 that work well. I prefer bolt guns, these methods may not be what works with auto's, levers or pumps. It also applies to calibers like 270, 300 Win mag, 7mm-08, 7mm Rem and such which have such varied sized chambers. cases and dies. 223 dies seem to be spot on and variations few, nice. The reason I added this is that even if you follow all the basics and do everything right it still doesn't work, and then it gets interesting. This is my first post on this grate site. Is there a relationship between barrel harmonics and bullet concentricity? Just doing some thinking here. I would guess, that the truer a bullet strikes the rifling, that the resulting harmonics would be lessened by the better concentric loaded bullet. Any thoughts on this? What is more important? O.A.L. or neck to bullet fit? My guess is that fit is more important. 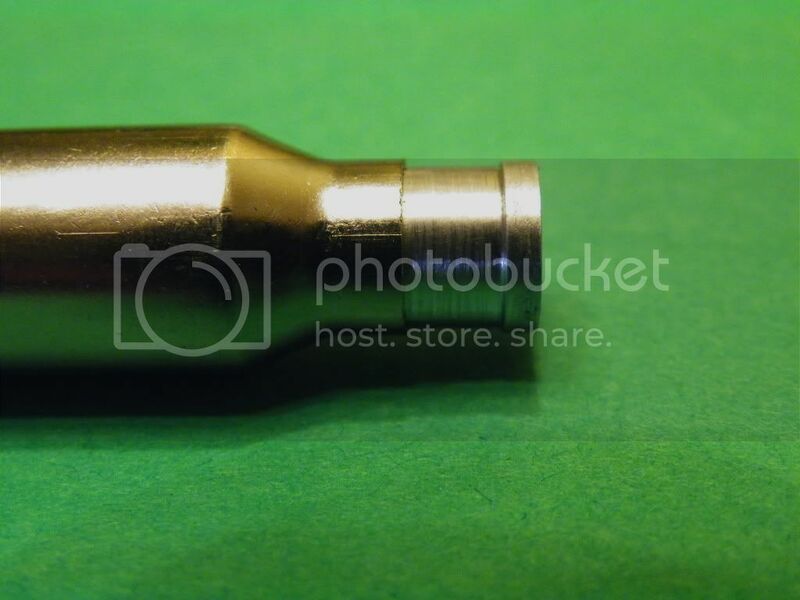 That is, the interference fit of neck to bullet. Using pressure type seaters, means that slight measurement "errors" will give a 1 to 3 thousandths difference in O.A.L. Best part was the emphasis on BOOKS BOOKS BOOKS. it got through my thick skull! Great info. It's a lot to digest. Small bites are easier for me to chew. I'll be focusing on books and case prep for now. Thank you! Great job! I have been reloading for 25-30 years and there always seems to be room to learn. We were in VB 1969-1973 with VA-176, Thanks for your service! Go Navy! There is definitely a correlation to harmonics and reloading I invite you to read Chris Long and Dan Newberry's papers on OCW and OBT. They have become the cornerstone of how I reload, Google is your friend. As to seating pressure......what ever you do, do it the same when working up a load. When it becomes time to "play" with it change one thing at a time be it primer type or seating depth or charge weight. As to concentricity of the round affecting accuracy yes it will but there comes a point where you end up chasing your tail for nil gain. Load as close to the lands as your rifle likes and carry on. Remember this article is about cost effective measures to produce quantity and quality for the average guy. When you get down into the 1/2 MOA ammmo to get to 1/4 MOA your gonna have to spend money. If I can consistently turn in ratty one hole groups with my drill press and a fist full of tools I think I am heads and shoulders above most out there. Even better if I can touch a 3/8 MOA diamond out to 500 yards. Then again I haven't fired a group in quite a while since Frank came out with his "Dot Drill"
S&B toned down the MTC recently?